I don’t know exactly when it happened, but the quantity and quality of the food on Oakland’s Piedmont Avenue has been giving Berkeley’s better-known Gourmet Ghetto neighborhood stiff competition for some time now. From one end of the street to the other, the strip is loaded with a growing number of good restaurants, markets and cafes. In fact, the street needs a nickname to highlight its multitude of culinary delights. How about Gourmet Gulch? Visually, the contemporary Vietnamese restaurant is a stunner. The dining room oozes hip urban swank. The long wooden slats and light panels running along the ceiling and one wall give the room a soft, den-like warmth. There’s an elegant, minimalist aesthetic set off by two gnarled sections of 100-year old Indonesian vine and eye-catching, origami-like chandeliers hanging above the bar. 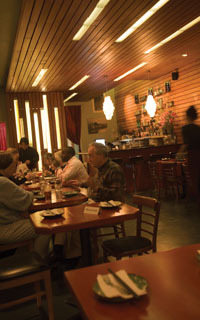 The earthy red and pale green colors on the walls make the restaurant feel both exotic and comforting. Exotic and comforting describe the food as well. 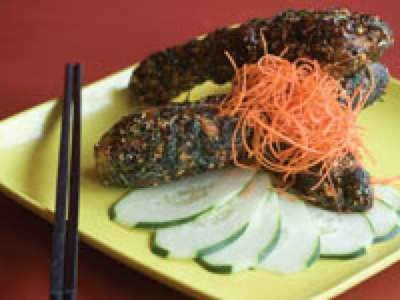 Xyclo’s menu is rooted in classic Vietnamese cuisine but has a stylish, western sensibility. The contemporary Vietnamese restaurant concept is not a new one in the Bay Area. San Francisco’s Slanted Door is probably the best-known purveyor of the cuisine. While purists may scoff at the westernization of Vietnamese food, these restaurants offer an entry into one of the world’s great cuisines to those who might not otherwise be exposed to it. Xyclo, which takes its name from the pedi-cabs that carry passengers around Vietnamese cities, is a partnership between 27-year-old executive chef Vy Lieou; her mother, Loan Dinh, and sisters Keng Lieou and Jinh Lieou. Vy Lieou, who was born near Saigon and says she’s wanted her own restaurant since she was in the fifth grade, graduated from the California Culinary Academy in 2002 and worked as a line cook at Postrio in San Francisco before opening Xyclo in July. The restaurant is a fusion of her culinary sensibilities and the recipes she learned from her mother, who works in the kitchen alongside her. Xyclo’s selection of rice paper rolls is a great place to start. Fresh or fried, the rolls are one of Vietnam’s signature dishes. Many of the rolls are less than traditional, but the goi coun roll ($7) comes closest. Tender poached shrimp, thin rice noodles, green apple, lettuce, mint and cilantro make this a delicious hand-held salad. Only the addition of green apple marks this as less than traditional. The tao roll ($7) combines crumbled tofu, shiitake mushrooms, lettuce, jicama and shredded carrots. The fresh ingredients sparkle on their own but really shine when rolled together. Although the accompanying peanut-hoisin dipping sauce is good, first take a bite without it to really taste the roll. Although it sounds simple, the green bean salad ($9) was the best dish I tried during my two visits. Snappy, fresh green beans are tossed with perfectly poached shrimp, paper-thin red onion, Thai basil and nutty fried shallots. But it’s the tangy, electric garlic lime vinaigrette that really makes this dish delicious. I had to restrain myself from tipping the plate to my mouth. diners to roll up the seven ingredients (shredded coconut, cashews, tiny dried shrimp, chili peppers, diced fresh ginger, red onion and tiny triangles of diced limes) in a leaf of lettuce. Looking like carefully weighed-out jewels, the little mounds of ingredients take on new life when combined together and dipped in the great dried shrimp-coconut-chili sauce. Sweet and sour dill soup ($6) is a fairly traditional rendition of a classic southern Vietnamese dish called canh chua ca. The sweet and sour flavors are subdued, but the chunks of pineapple and tomato give this soup a lively acidity that balances out the richness of the fish. Five-spice chicken ($12) was the only dish that was just OK. Tender chunks of grilled leg and thigh meat are dusted with the aromatic, subtly fennel-like flavor of five-spice seasoning and served along side garlic-herb rice pilaf. It’s a good, but not particularly unique, dish. Far better choices are the fantastic bun cha Hanoi ($14), grilled pork and shrimp in a great fish sauce vinaigrette with rice noodles; and the Xyclo chili ribs, plump pork ribs encrusted in a white and black sesame seed and herb glaze. This dish verges on too sweet and so might be better shared, but it’s unique, flavorful and a perfect match for one of Xyclo’s lively white wines or premium sakes. Slanted Door’s “shaking beef” has become an oft-imitated classic of modern Vietnamese food. Xyclo’s version is called tumbling dice ($18), and it’s arguably better than the original. Tender cubes of still-pink filet mignon are tossed with onion and garlic in a dark, savory glaze and topped with a refreshing watercress, red onion and shredded cabbage salad. It’s outstanding. As exciting as most of the menu is, desserts ($4) don’t evoke quite the same thrill. All the usual suspects are here: fried banana, fried ice cream. I did like the Vietnamese rice pudding of sweet, almost-disintegrating rice and black-eyed peas cooked in sweetened coconut milk.But with or without dessert, Xyclo is still one of Piedmont Avenue’s bright lights. OPENING PAGE: Xyclo’s meaty-but-sweet chili ribs pair well with sake. OPPOSITE PAGE: The goi con roll adds green apple to an otherwise traditional rice paper roll at Xyclo, where an urban swank vibe prevails. 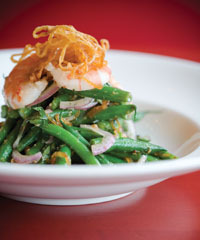 THIS PAGE: Our reviewer proclaimed the simple green bean salad (above) the best dish he sampled on two visits.